1. The munchkins and I took advantage of cool weather and a brand new zoo pass today and went down to the Houston Zoo for the morning. I love having annual passes to things like the zoo, amusement parks, or museums because there's no pressure to see ALL THE THINGS in one day. We enjoyed being outside, saw some animals, and learned a few things about the best way to take two very independent toddlers to the zoo (hint: just stay a couple of hours because who has the energy to constantly say "this way. over here. this way. stay with mommy" all day long). C did pretty well, but M is definitely 17 months old and still figuring that whole thing out. I trired a little backpack leash we have with him, but it was...unsuccessful at this point. We'll try again. 2. I got into the habit of using a blog feed reader when I was working as a librarian and keeping up with lots of book and library blogs, and it's something I still do to some extent. I'm going to try out a new feed reader though, because I kept having trouble with the app on the old one. 3. New running shoes came in the mail today!! And I signed up for a spring half marathon yesterday. The Oklahoma City Memorial Marathon (and half marathon). I'm a little nervous about starting to actually train for something, but I need a little shake up in my running routine. 4. I do pretty well most days at just going with the flow when it comes to M's food allergies, but today I just really, really want to order pizza for dinner, and that's a no go for him. Maybe I can fudge something for him and he won't notice that he's eating something different and can't have bites from our plate. Or maybe I'll find some motivation to cook dinner. We'll see! 5. Started The Undoing of Saint Sylvanus this week, and so far am enjoying Beth Moore's first foray into fiction. J and I also started watching Stranger Things (finally, right?) and even though we are only three episodes in I am hooked! It was a good weekend for stories at my house. 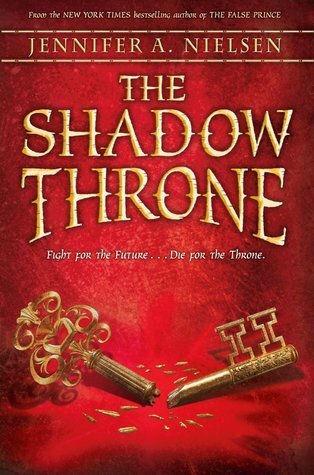 First, I finished The Shadow Throne, by Jennifer A. Nielsen (third book in The Ascendance trilogy) and was a solid, satisfying ending to this fantasy trilogy. I'm not going to say much about the plot so as not to give away any spoilers, but I can tell you that this trilogy's strength lies in its tight pacing, great characters, and the various relationship dynamics. There may be a little romance in the books, but the story doesn't hinge on that, which was refreshing. And while the story itself isn't groundbreaking, it told a familiar story in a fresh voice and felt like the best kind of comfort food. 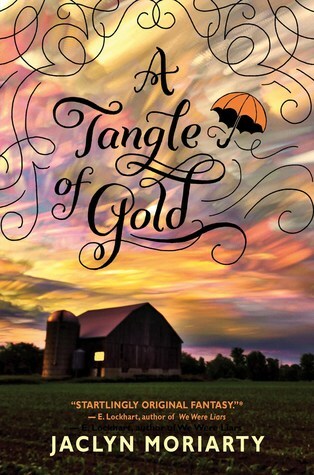 I also devoured A Tangle of Gold, by Jaclyn Moriarty, another trilogy conclusion (The Colours of Madeleine -- apparently this was also the weekend of trilogies). I can't say enough how much I enjoyed these books. For one thing, worldbuilding is unique and magical, grounded in reality, but a slightly bent and colored reality. Second, it's just a good story, and as the story unfolds, I kept telling myself "this isn't what it seems" or "this has to mean something" and "wait a second..." The author does a good job of gradually pulling all these teasers and hints and glimpses into focus throughout the trilogy, and in this book in particular. It's also a book with characters that started feeling like friends. I appreciated how the characters grew and developed and learned and weren't stagnant. The books are fun, but with depth and substance, and basically, these books are delightful. I didn't want it to end and I wanted to hang out with everyone in it forever. 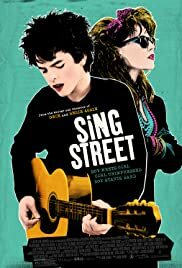 And finally, Sing Street. Y'all. This movie. I seriously wanted to watch it again as soon as I finished it, although preferably with a friend to share the experience. Sing Street has been on my radar for a while, and I'm so glad I finally pressed play. It's set in 1980s Dublin, where we meet Conor, a 15 year old boy who loves music. When the movie starts out he's been sent to a new school. It's rougher than his old school, and he runs into bullies both in his peers and in the school administration. He meets Raphina -- older, mysterious, edgy, and gorgeous. He tells her he's in a band and wants to use her in a music video so he can get her number. When she says okay...well, then he's got to start a band. The movie is about music, friendship, growing up, finding your voice, falling in love, heartbreak, hope, family, and taking chances. It's a coming of age movie, a brother move, a friend movie, a romance. (And for real: the number one relationship of this movie is not Conor and Raphina, it's Conor and his older brother Brendan. Such a great and unexpected part of the movie (on a side note: I kept thinking the actor looked like a cross between Chris Hemsworth and Chris Pratt). In addition to the brother story, I think all the supporting characters just really elevated the whole film. No matter how seemingly small a part, each character was exactly pitch perfect. Eamon, Barry, Ngig, Penny and Robert and Ann, Brother Baxter....all of them, just super solid. Anyway, I loved this movie. Loved it, loved it, loved it. 2. First run of 2017 -- Saturday, home in Houston, podcast on, and brrr....it was actually cold. Not as cold as it is where my running friends live in Pennsylvania, Nebraska, and Michigan...but I had to bust out my hat and gloves, for sure. Not my best run, to be honest, but the sun was shining and I moved for 3 miles (40 minutes. Yes, I'm slow) and it was great! 3. My word of the year this year is "present." I want to embrace my present, the things I like and the things I don't. I still want to set goals and go after them, but with an attitude of contentment grounding me. I want to be present in ever day -- with my family, my friends, my neighbors. Now, my children are already reminding me that in this season of life, "present" also includes "flexible." My little people like to play havoc with my sleep, so I'm trying to remember to roll with it. Would I like to set the goal of getting up 30 minutes early each day to write or run? Sure! But when the kiddos spend the hours of 3:30 and 7 a.m. taking turns waking up, that's not going to happen. I make the time when I can. Does this mean that for this (tired) routine-loving girl those "me" things or projects may not happen as often as I'd like? Maybe so. But I guess it gives me something to work on. 4. Brought some Port City Java coffee home from Wilmington. Ahhh. In addition to adding a bit of deliciousness to my coffee cup, it makes me feel a little more connected to the dear friends we got to see while we were out there visiting over New Year's. 5. I'm reading The Shadow Kingdom by Jennifer A. Nielsen right now, and have a library copy of A Tangle of Gold by Jaclyn Moriarty waiting in the wings. Also trying to catch up on my favorite podcasts and still leisurely reading Present over Perfect by Shauna Niequest. I've been reading that one for a while, but it's not one I feel the need to rush through. Six years ago, Jeremy and I signed up for a money class at church mostly because a bunch of our friends were doing it too. We were pretty broke, and had quite a bit of debt, so we figured it didn't hurt to get a few ideas. Well, that particular class -- Dave Ramsey's Financial Peace University -- hit us right where we needed it. It was the right information, at the right time, with the right people, and in a way that really connected with us. Taking that class put us on a more firm trajectory toward...well, financial peace. We gained a new vocabulary, new tools, and a fire in our belly to change our lives. We sat in that class living paycheck to paycheck with balances on six credit cards (a few overdue, if we're getting real honest), a vehicle payment, and a chunk of student loan debt. Today, we made the final payment on the final student loan and can greet 2017 debt free. It's been a long and in some ways a circuitous journey. These six years have contained career changes, two major moves (one halfway across the country), and two kids. We've had our moments of focus and some times where we've chosen to be a bit more lax. We've learned to communicate better over money, and can honestly say that it's gotten to be less and less of a relationship stressor. We're on the same team, have the same goals, and that is such a good thing for us. Paying our debt off wasn't an easy thing. We had to make sacrifices, cut corners, work long hours, and make tough choices. We've become more aquainted with delayed gratification. I'm not saying that to pat ourselves on the back, just to acknowledge that it wasn't something that just "happened." Sometimes we made choices that looked different than everyone around us. Fortunately, we also had friends walking the same road. Having support in our community was crucial to helping us stay the course and not get discouraged. They understood when we chose not to go out to eat, or go on vacation with them, or hire a babysitter to go out to the movies. They cheered us on, shared their own tips and advice, and gave us hope as we watched them experience their own debt-free journey. I say all this for a couple of reasons: first, I'm just excited. Being debt free is an amazing feeling. A little surreal still, but amazing. Second, I know that lifestyle changes particularly with money are not as simple as "just". There's rarely an easy fix, no cut and dried solution. If you are struggling, I get it, and I hope 2017 brings a light, some clarity, and a little hope. Third, I know this journey is not over. I'm looking at a lifetime of being intentional with my money. A lifetime of deliberate choices to stay out of debt and to model good financial behavior for my kids. Most importantly, a lifetime of honoring God with the way I handle money. Being generous, ethical, and wise. Of approaching money with an open hand, knowing that what I have could be gone any second, and that when I have a penny to share, I should. So I end this year grateful, hopeful, and a whole lot lighter.